Which is why we have been advocates concerning the protection of a significant Frank Lloyd Wright designed home which we as local citizens, and as well as the Historic Preservation department of the City of Phoenix, The Mayor’s Office, and a variety of other Local and National organizations, feel may be in danger, and we have committed ourselves personally to promoting a constructive dialog in regards to this beautiful home, doing all we can to help keep it intact while working within appropriate boundaries. In concert with large community response to this situation, a Planning request was made that the David & Gladys Wright House be considered for Landmark Designation and be placed under the City of Phoenix historic preservation overlay. The Planning Commission passed the request and now begins a process that may ultimately lead to protection of this home. Far from a given outcome, as a matter of opinion and suggestion, urge you to keep informed on this situation and what process is being made, including expressing your interest in this case with the City of Phoenix Planning department. This commentary is not solely about a single home: Preservation of this significant home is not just about a significant home by a most significant Architect. It’s about saving our collective visual legacy and community pride. It’s about the legacy we choose to cherish… what we choose to save that is used to define the past, and the future, of Phoenix. It is, and should be a conversation and exercise of free speech about the very nature and necessity of preservation in our community. Are we about innovation? Are we about living in, and of, our unique desert environment? Are we a City that uses the lessons of the past to guide how we meet the challenges of the Future? If our answer is yes, then preserving this home is paramount to maintaining the legacy that area Residents deserve to have. It is why we chose to not allow development to the very top of Camelback Mountain. Landmarks; geographic, cultural, historic, and architectural, must be preserved so that we can remember why we came here in the first place, how we have lived here, and where we can go in the future. Like many people now living in Phoenix, or those now considering making a life here; Frank Lloyd Wright came to our Valley with a promise for the future. A vision of how we can shape and define a desert community. This home, one of just a handful of remaining Wright designed structures and homes in the Valley, exemplifies not only an important piece of the Architectural Heritage of our Valley, but a representation of the hope and optimism that remains our obligation to nurture. However, when it comes to protecting these buildings, we lag the nation on this. Is it because we are a relatively new city, and the fact that so many of us come from somewhere else? Perhaps. The fact remains that Architecture is not celebrated here to the level that it is in other areas. That as a community we have not effectively implemented a valley-wide system that would have defined and protected our historic architecture is frankly shameful and speaks to a level of immaturity that we still possess here as a community. Most people may not recognize it, but woven into our history here, especially from the turn of the last Century until now, is a unique relationship between weather and design, which brings us tourism and resorts, custom homes and desert retreats, plus the ability to build and live in the desert in a unique way. Simply put architecture can be unique here because our place is unique. Architecturally, It’s a land of grand experimentation and infinite possibilities. This is especially evident in post-war structures and designs. There is an underlying impression that we are teaming with post-war modern designs, when in fact we have some excellent examples, (we have lost so much) the percentage of our existing buildings is a small fraction. 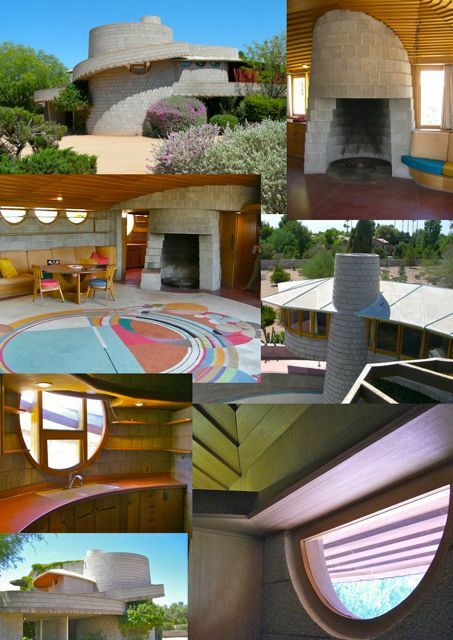 So if one of just six remaining Frank Lloyd Wright homes is this threatened, allowed to float out there unprotected, then I fear for every other unique and historic building in the Valley that remains without some level of safeguarding against destruction. We can, as a community, implement creative options that can benefit owners of properties of this caliber, and promote and support good decisions by owners that will protect the heritage and legacy of the City. The tools are here for this, it’s past time that we give enough power and support to local authorities to implement them. We urge that all possible steps be taken in the future by the Planning Commission, the Historic Preservation Commission, and the City Council to ensure the continued existence of this important building. Please express your opinion and support for swift preservation and continued protection of this home. Your voice is important! Finally, we need to remind you that this, like all the Musings posted here, are opinions, observations and commentary. They express a viewpoint and perspective that is meant to be constructive plus informative and are indeed an exercise of civil liberty and free speech. Nothing here carries any malicious intent, nor is intended to incite any actions that would interfere in any way with the free and unimpeded exercise of commerce between any and all parties that may be association with any of the properties mentioned anywhere in this publication.